Want to try the trapeze® for yourself? We are pleased to offer a risk-free 30-day trial for just $1! Achieve Deeper Backbends & Instant Back Pain Relief w/The Yoga Trapeze®!The Yoga Trapeze® is the most powerful, at-home yoga inversion tool ever created. Hang it from the inside on your doorway; or outside from a beam, bar or swing set. $1 Trial! Yoga Trapeze® Purple (30 days) with Free DVD Tutorials has been added successfully to your wishlist. Want to try the trapeze® for yourself? We are pleased to offer a risk-free 30-day trial for just $1! Achieve Deeper Backbends & Instant Back Pain Relief w/The Yoga Trapeze®! The Yoga Trapeze® is the most powerful, at-home yoga inversion tool ever created. 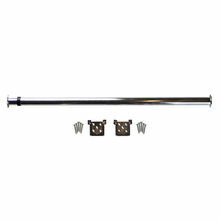 Hang it from the inside on your doorway; or outside from a beam, bar or swing set. Setup is fast and simple, results are immediate. Our students report that the Yoga Trapeze® is more effective than an 1-hour deep tissue massage or a multiple series of chiropractic adjustments. The Yoga Trapeze® strengthens and loosens the muscles surrounding the spine naturally—so you can eliminate the source of the pain both short and long term. TRACTION: The Yoga Trapeze® creates natural, body weight traction… the safest and most effective kind. BACK & CORE STRENGTHENING: For dynamic, deep core strength, nothing compares to inverted, gravity resistance training. FLEXIBILITY: Just hang back, grab your ankles and chill out… this is the safest, deepest backbend I’ve ever done unassisted (and pain free). You’ll make flexibility gains effortlessly. Relieves lower back & neck pain in minutes. No experience needed, everyone can use it with zero training and fast results. Easy to install indoors or outdoors in minutes. I recently had knee surgery and was having difficulty exercising due to pain and swelling – the Yoga Trapeze helped me gain flexibility and range of motion back without bearing weight on the knee while recovering. I have bad knees and I´m overweight, so the normal classes are impossible. Using a ball was downright scary for someone my age (66). Chair yoga was good but not much out there on it. I use the Yoga Trapeze for stabilization during the poses as well as taking the pressure off my knees. I use it for my arms as well. I’ve only had it a few months, but since it hangs there calling to me, I use it more often than other products. I love my Yoga Trapeze! I LOVE Aerial yoga and now I have my own Yoga Trapeze to take to class with me. I love it so much! I love my Yoga Trapeze. My Inner Child loves hanging out in it exploring, experimenting, playing. I end up holding postures longer with more comfort. Thank you! The Yoga Trapeze has helped my back problems tremendously. I also find it very stress relieving. I have SI joint and L4 & L5 injury, so it helps with the pain! Absolutely amazing! Does exactly what they advertise! I have lots of low back pain and hip issue, and with doctor´s approval, this has brought instant relief! Thank you for an amazing product that after using makes my entire day better! Love the workout and strength this brings, not to mention the great meditation poses I can achieve with this! I love my Yoga trapeze... it's harder than what I have expected it to be which is a good thing because I like to challenge myself. I am back to doing yoga on the mat at least 5x/week and enjoying it while getting fit. On the weekends I bring my trapeze to the forest to enjoy a relaxing moment. Even my bf started doing it (and now he loves yoga!). I am happy to be back to doing yoga like I used to and I thank Yogabody for helping me get back to something I love and feel connected to. I love the yoga trapeze, I just got into yoga a month ago and loved what I could feel on how my body started feeling better. I seen this trapeze on how to stretch better and do back bends and to relieve back pain. Well I love it,it so much fun and my back is feeling great. I highly recommend!! As yoga has always helped in my focus, stress management and flexibility, it didn’t give me the core strengthening needed to maintain a happy lower back. I have been battling lower back pain for years. Since I started using the Yoga Trapeze, in moments, I can find relief. …nothing gives me back joy like this! Great supplement to my practice. Also LOVE the benefits to my skin from the Trapeze inversion. So good! I can see that the Yoga Trapeze will last a long time because of its quality. I’m very happy with the quality of the material. Hanging upside down is now an everyday routine! I have been using the yoga trapeze for less than two months and i really enjoy it. Right from the start, as soon as it arrived I told the teachers at the yoga studio and some of my friends about it. Recently I have had a little discomfort with sciatica and the trapeze is a good way to move without causing more pain. As the weather gets warmer we will be hanging the trapeze out on the back porch and there will be more room to get creative with my yoga moves. For now, I have to say that getting the trapeze in the dark days of winter and hanging it in the living room where the afternoon sun shines in has been a most pleasant way to enjoy my yoga practice. Aerial yoga, the feeling of floating, swinging, hanging upside down, all of these things give me the feeling of carefree childhood and so I would say that the yoga trapeze is great for my health, because it’s fun!! Thank you guys SO very much! The Yoga Trapeze has helped me lose weight and gain flexibility, it has also helped my husband with severe back pain and my daughter loves to use it as a swing. I absolutely love the Trapeze! I absolutely love the Trapeze! I am able to access poses that have not been possible on the ground yet and I love being able to focus on opening up my body. The Yoga Trapeze has brought aerial yoga into my home and allowed me to work on lengthening my spine and opening my chest after sitting at a desk all day for work five days a week. I've only been able to practice with the Trapeze just a little bit so far, but I am loving the ability to get traction on my spine while hanging upside down. Really helps me unwind after a long day at work. I had bilateral knee surgery and was unable to do any type of weight bearing exercises. I used the Yoga Trapeze so I could take the weight off my legs and still do some yoga and exercises that helped me stay sane during the post op recovery. I travel quite a bit and it is small and portable enough that I can take it everywhere. I absolutely love it! I am 45 yrs old and find it very easy to use, as well as my 67 year old mother. The yoga sling/trapeze along with regular yoga classes (that I do on YouTube when I am traveling) has helped ease back pain, increased strength and flexibility, and has given me an overall feeling of well being. The Yoga Body Trapeze is helping me make my body more and more flexible. This also helps me recharge for whole day. The Yoga Trapeze adds a new dimension to my (much too few) workouts. Too early to know if inversion will help my back pain and sciatica. Working on the trapeze clearly is excellent for core muscles and adds variety to routine calisthenics. I feel better, more energized, and ready to tackle the day after my morning workout with my Yogabody Swing. The Yoga Trapeze has helped my lower back from hurting with the decompression poses. Also it has helped me to ease back into yoga after a long lapse in my regular routine. The Yoga Trapeze has been great for my back flexibility! I have also used it for a number of yoga poses that are difficult to achieve on the floor which is also helping with my overall flexibility. I am thin so being aerial removes the pain from the pressure of the floor on my bones. I got the Yoga Trapeze to do inversions at home since my local anti gravity yoga class no longer fits my work schedule. I have it installed on the door frame bar and I use the trapeze all the time, that plus a new bed and my back pain is virtually gone. I also use the bar itself for pull ups and arm strength. I've been working with a trainer on functional training. Adding in the Yoga Trapeze has helped me maintain and enhance my flexibility as well as providing a less severe practice. The Yoga Trapeze has increased my flexibility, creativeness, focus and enhanced my floor and wheel practice! We have a small private PT practice focusing on orthopedic rehabilitation. The YOGABody Trapeze has been an amazing addition to our therapeutic modality options. Thank you so much for developing this product. With the Trapeze I have been able to get rid of pain and tension while getting even more flexible. I LOVE my yoga sling. I have compressed nerves in my spine and to be able to invert (which I do every night) is a huge benefit. My symptoms have lessened. It also allows me to use gravity for a deeper stretch. I have always been intimidated by yoga because my balance is not the best but the yoga trapeze is helping me achieve poses that I otherwise was too nervous to try. I love the support it provides while allowing me to stretch. It brings out the kid in me when I get to hang upside down and motivates em to keep coming back to it each day because it is fun, sturdy, and lets me try new stretches. A Trapeze purchase is how I found Yogabody. I practice yoga at my local gym and at home with Yoga Studio app. Using the trapeze for inversions is great for back pain relief. Well the yoga trapeze is on an A-frame, in my living room! It takes up quite a bit of space which I'm fine with and I use it all the time. I have a disc fusion in my lower back and it helps with the pain tremendously. I am not a fan of taking medications and this helps alleviate the pain. I also have snapping hip syndrome (I know more hip openers right?!) haha. Well probably my favorite thing to do in the yoga trapeze right now is hip flexor stretches. I am naturally flexible and not that I can't achieve what I want to with just my body but the trapeze helps me achieve a deeper stretch with I enjoy. I honestly forget I have the massage balls a lot of the time…I should start using those. I purchased the yoga trapeze initially to be able to continue my yoga practice after I shattered the radial head in my left arm. It allowed me to do many poses without full weight bearing on my arm as I recovered. It also helped with making sure I kept up the range of motion and helped build strength back as well. The yoga trapeze has been amazing for my back and overall flexibility. I have found it to be the most effective way to stretch after a work out. I have also found it to be a great way to deepen my meditation practice. My yoga trapeze is hanging in my bedroom and has been an amazing addition to an already peaceful space. The Yoga Sling has been so key to my spine, hip and pelvic bones health. Now that I can stretch so deeply and allow my spine and discs to align, my hips and pelvic bones align so easily now. My pain level is much lower and most of the time, altogether gone! I just can't get enough of my Yoga Sling. My lower back issues have disappeared completly!!! The Yoga Trapeze allows me to do deeper bends. I could not perform inversions before the yoga trapeze. It´s helping me improve my posture. I love it and so does my entire family! The Yoga Trapeze has made all the difference! I love it and so does my entire family! The yoga trapeze has helped so much! Having the Trapeze led me into taking aerial teacher training! Loving it! My back has never felt so good! It's helped a ton. I love the yoga trapeze the most. It's totally changed my body and it's helped my back. I'm much stronger too. I could notice results from using the Yoga Trapeze right away. I have more flexibility, a lot more energy and people have even complimented on the tone they see in my arms!! My flexibility has improved in a short slung of time after I started using the Yoga Trapeze. The lower back pain I used to get frequently is gone. I bought the yoga trapeze to help with back pain and I can't believe how much it has helped me! Love it!! I have a desk job and very tight hip flexors, lower back, and shoulers and neck. The trapeze allows me to get a deeper stretch for the hip flexors as well as my entire back. My flexibility has improved which is helping my resistance training since I can squat deeper without as much tightness. I'm also saving money since I haven't had to go back to the chiropractor since ordering the trapeze. The trapeze has dramatically improved my back bend, upper body strength & overall flexibility in a very short time period. My YogaBody Yoga Trapeze has become absolutely vital in helping me to maintain a pain level that I can live with, daily. After 2 serious accidents, 1 skiing in the late '90s and 1 motorcycling in the early 2000's, I've become a fairly serious chronic pain patient with a lot of irreparable deep tissue damage causing chronic muscle spasms, coupled with degenerative disc disease, bone spurs, a crushed C-6 vertebrae and now arthritis is setting in over much of my body. I also suffer from carpal tunnel syndrome and have a weakened right hip. Pain medication can only do so much, and I've found that using my Yoga Trapeze 3-5 times daily, getting upside down, is allowing the fluid in my compacted discs to be replenished, it takes the stress off my crushed vertebra, and allows me to move gently, twist and bend smoothly without jarring my body and dealing with normal gravitational issues … that are so much the cause of much of my major pain. I had been looking for an inversion table, but am SO thankful that we found the Yoga Sling before I laid out $300+ because it does everything the table would've done and *more*, and in a much better, gentler way. I love my Yoga Trapeze, I haven't done a ton on it, but would love to do a training eventually. I love the handles, and then width of the seat, it makes it accessible and comfortable. I am disabled and suffer from Fibromyalsia. And have a very hard time with stretching. You have changed my life, with my Yoga trapeze. I have started out basic stretching, and I am suffering with less pain, and can move alot easier. Thank you so much. You have given me a second chance. I am 46 feeling like 96. Since purchasing the yoga trapeze it has propelled my mind and body deeper into the Yoga world. The trapeze has helped in opening up my back. When I use it I happen to sleep better at night. The Yoga Trapeze has helped a lot with my rheumatoid arthritis. I feel more flexible, I learn a lot everyday from the talk show. I recommend it to my clients. And I love to learn and feel you are very professional and very clear and concise on instructions and feel that I never have to guess what to do with the Trapeze. Love it !! The trapeze introduced a whole new dimension for practice. The back and neck series has been very helpful in working through issues that I was having. I love that you have so much information available in the courses and on the site. I am a reader and a learner so I love that aspect. I enjoy getting the emails and listen to the podcast when I can. Thanks for all that you do. Sitting at desk all day its hard on my body and this helps me to realign, and also to be upside down gently helps my mental state and helps ease my fears. The Yoga Trapeze has helped increase my flexibility and relieved my back pain. I have been practicing ashtanga for one year and I have been doing aerial yoga a bit during my travelling.. and after I got back home, I always wanted to have some hammock. So I got my yoga trapeze about 2 weeks ago and after it was installed on my ceiling, my kids (2,5y and 4,5y) have occupied it :) Smallest one loves to swing and biggest one already knows how to do inversion. I tried to do superman pose, but my hands are weak. I hope to get more bendy thanks to the yoga trapeze. I bought this for my wife and it is hung in the spare room next to my office. I see it sitting there every time I walk by and something about it is inviting, then the realization hit that many of the exercises I was looking to do with my TRX system, in my office, is achievable and even more comfortable on the yoga trapeze. I have a very bad back, neck and shoulders and am always looking for movements that combine stretching and slight muscle activations and the yogabody is exactly that and more. With the three different sets of handles, I can walk into the room, even if I only have a few minutes and do some very simple assisted squats and then turn around and do some butterfly arm exercises, etc. I've even begun making up slow motions that I haven't seen in a book or watched on DVD, but seem to "fit" my body and needs. Most importantly, I can do all this in an "assisted" and comfortable way, while engaging my core and strengthening my back. I have just begun the long journey from being broken and terribly overweight to being fit enough this coming Spring to attempt a Tough Mudder run and I am hopeful that with the yoga trapeze assisting me, I will be able to push through the back pain and lose the weight and gain the strength necessary. Since using the Yoga Trapeze I have been feeling so much better I start my day with a few of the easier positions it seems to make my day go so much better and I have more energy, less back and shoulder pain. I just like the deeper stretches and inversions on the Yoga Trapeze! The Yoga Trapeze helped my flexibility and my upper body and core strength. I am able to get a fuller range of motion for sit-up and push up exercises on the swing and the stretches that open up my chest have been wonderful. I especially like that it is fun and therefore does not seem like a chore. Love the Yoga Trapeze! Totally changed my practice, can feel myself getting stronger daily! Family also loves it! Has helped with my parents back pain! The Yoga trapeze gives me the benefits and access to intense inversions without impacting on my skeletal structure and enables me to build upper body strength in a more creative and fun way! I was feeling a bit run down and started taking B12 liquid drops and felt the difference within days. My mind was more focused and my stamina increased. Love the yummy taste too! The yoga trapeze is great !! Helps me with stretches that I can't normally get into. My daughter does gymnastics, and she loves it as well. Her favorite is getting into the splits with the yoga trapeze… Thank you yoga body!! The Yoga Trapeze makes my back feel better by just hanging upside down. It completely eliminates any pain. After we moved in July, my back hurt almost every day for a few weeks. Using the yoga body made the pain go away instantly. I have told many friends about it and even a random lady next to me on the plane. We keep it out in the garage and we live in Montana so even when it's been below zero outside, I'll bundle up and go out there and hang. My husband loves it too! He's better at some of the poses than me. We both have gotten good use from it. Thank you! I was waking up every morning with mild headaches, likely due to pressure built up in my spine from my job. I sit at a computer 80% of the time. Everyday after work, I hang upside down for 3-5 minutes, and I have noticed a significant reduction in the amount of soreness in my joints the following day and no more headaches! It's absolutely amazing! Currently, the trapeze is hooked up to my husband's pull up bar; however, in a month, I plan on purchasing the Trapeze stand. After I graduate from my Master's program this year, I plan on enrolling into the Teaching course, as this is something that everyone should be doing. I recently got the trapeze for my wife for Christmas. I also have had back issues and with shoveling snow it was bothering me. I get where I cant even bend over and can barely walk. So the day after Christmas I put up her trapeze for her and tried it out. I tried the traction jackson and almost instantly my back felt better and my hip popped back into place. I was back to walking upright in two days. I still am having sciatic nerve pain but my back and hips are in place and I feel great. As for the wife I have used her gift more than she has. Thank you for a great product. This product provides relief with my back, has aided in improved flexibility and just gives me an overall feeling of "wellness" since incorporating into my life. All of the YogaBody products have been great purchases. The yoga trapeze has helped with my strength and flexibility. It is also can be very relaxing with some of the poses. The toe separators have helped with foot pain and made my feet feel like they have been loosened up. I had waited to purchase the yoga massage balls until I could try them because I have other products that are similar; however, the quality of these ‘hurts so good’ balls made me decide to purchase them, and I am grateful I did. They work on those areas where it is hard to get into, and the ‘soft’ firmness works wonders. The yoga flow practice I recently purchased and am just starting to get into the routine. I love the flow/sequence, and can see improvements already. I would highly recommend all of these products. I have back and neck issues and the yoga trapeze helps me stretch and relax parts of my back that I wouldn't normally be able to. I can stretch and workout, it also can be used as a semi hammock and just chill in. My kids love watching me, they think it looks so cool. Besides being totally relaxing to just hang in an inversion, it helps me with spinal decompression. I teach yoga 5 days out of the week. Within days of using my yoga body Trapeze, I could feel myself moving deeper in back bends. The trapeze challenges my creativity and is even a great tool for meditation. helps even with weight loss! It's helped relieve some pain n my neck & back. It's also helped with a little weight loss. back pain is 85% better in just 7 weeks!! I've been suffering from low back pain for 5 years now. Using the yoga trapeze and doing the exercises recommended in the Foundations book my back pain is 85% better in just 7 weeks!! It has helped me get deeper stretches and has helped me gain flexibility! I love the yoga Trapeze and tell everyone I can about it! Awesome! I love hanging upside down and allowing gravity to stretch me. I love the Trapeze! Supports so many great poses and stretches! I have a lot of chronic back pain so it feels really good to invert and traction my spine. The Yoga Trapeze has helped me continue to build my core as well as accomplishing deep stretches after my soccer games and running. I love it and tell people about it all the time! It has definitely helped with a lot of back pain issues as well as getting to be able to go deeper into stretches! Passive inversions have never been so comfortable! The trapeze is such a fun tool to open parts of my body which are hard to access otherwise. Passive inversions have never been so comfortable! I could feel relief on my poor spine almost immediately! I have awful back pain due to DDD/herniated disc disease, I had to have surgery a few years ago and I'm trying to avoid any more back injuries. I really like the "traction Jackson" move, I could feel relief on my poor spine almost immediately! Also the twists feel great, feels like I can get a much deeper twist on my whole spin on the trapeze than I can on the ground. I was very intimidated by the trapeze yoga at first, but I found that getting into the poses is much easier than anticipated! I'm glad I gave it a shot! The Yoga Trapeze has become my excelsior of life! I can't start or end my day without a good hang on the trapeze. Each time I am getting more and more confident, and my upper body strength has increased way more then I have ever been able to do with my regular practice, ( honestly, Im not a lover of chaturanga, I know bad.. ) but with the Yoga Trapeze, Im even amazed at how much of my own body weight I am able to hold without stressing out other parts of my body or hurting my shoulders.Namaste ! The Yoga Trapeze are absolutely amazing! I love using them, and actually cannot get enough of them! They stretch, strengthen, and lengthen! I love sharing them with friends, and learning new moves and poses!! They are challenging, but very encouraging! Hanging upside down is absolutely the best, and fantastic for all my hip pains! I use it mostly to stretch. I find it entertaining and effective in getting the deep stretches I want. I love the feel of inversions and the Yoga Trapeze has helped me. I wish there was a chart for trapeze poses though because I find I don't know what I'm doing even after watching the video, I just flip upside down. Did wonders for my back! So great for helping me get expansion in back bending postures– gravity working with me is making a big difference! helped me in many ways!!! Yes!! It's helped me in many ways!!! I've always loved stretching and working out. It's helped with my breathing and staying more fit. And my kids love it too!!! Tremendously! I've been raving about the products to everyone! It has been the best investment I've made for my health in a long time! I use this everyday I can. I am 30 with chronic lower back pain (there are many contributors). Using the trapeze has given me the ability to do yoga and enjoy it. I have increased my strength and flexibility. I went from leaving my house 4-8 times a month to almost everyday. Can't even explain fully how amazing this product is. Thank you YogaBody!!!! A friend has already purchased one after trying mine, now my cousin wants the link to buy it. It sells itself! 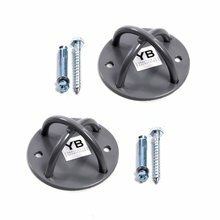 Yoga Trapeze Ceiling Hooks | Professional Quality Suspension Trainer | 2 Pack w/ Bolts View Sale!